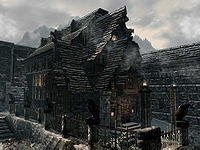 Viola Giordano's House is the home of Viola Giordano in Windhelm's Stone Quarter. Viola Giordano is the sole occupant of the large two-story Nordic-style house in one of the better neighborhoods of the city directly opposite the house of Clan Shatter-Shield and to the north of the graveyard and Hall of the Dead, but she rarely spends much time there. That Was Always There: Return a ring to its rightful owner. The house is completely open-plan downstairs with a single room extending the length of the house and support pillars along the right-hand third of the house. The house has many food sacks around the place. Upon entering there is a chair in the northwestern corner, with some crates beside it and a drum on the floor. There is a wooden table in an alcove on the north wall, with a knapsack, a pickaxe and plate on top. At the other end of the room is a matching alcove with another table in it, which has a gourd, a skeever tail, two Nordic barnacles, three rock warbler eggs, a salt pile, a pheasant breast, a rack of dog meat and a fillet of horker meat on the table and a bowl of bone meal on the floor under it. To the left of the alcove is a set of shelves holing a bottle of alto wine, a bottle of Nord mead and three goblets. On the rear wall is a large fireplace with a cooking pot hanging in front of it and tables on either side. The table to the left has a salt pile on top and a basket in front containing a cabbage and potatoes, while the table to the right has a pile of firewood including two loose pieces on top. There is a long wooden table and benches in front of the fireplace with two bottles of alto wine, a bowl of red and green apples, a plate of three salmon steaks, another with a baked potato and grilled leeks, a salt pile and two goblets. 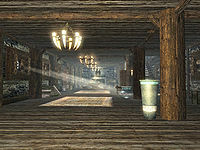 In the southeastern corner is a square wooden table with a mead barrel on top, with another alcove to the right with a long unlocked chest in it and a set of shelves to the right holding various pieces of cheese and a bottle of Nord mead. The stairs leading up to the top floor are against the south wall with a wall screening them from down stair. On this south wall is a set of shelves holding a bottle of alto wine and three common books, next to this is a chair. There are a couple of large empty vases next to the pillars and to the right when entering is a dresser which is used as the drop off point for returning the ring without Viola's notice which has a flute on top of it. There is a fourth alcove to the left of the dresser with a few barrels in it and some more crates against the south wall, to the left of the alcove. At the top of the stairs there is an alcove on the right with three cow hides piled on the floor. In front is a tall wardrobe containing clothes. Along the edge of the stairwell are two more large empty vases and a low table and chair. On this table is a solution of extra magicka, a copy of The Book of Daedra and some bread and cheese. Against the south wall is a tall wardrobe with a square wooden table to the right of it and a copy of Spirit of Nirn on top. Against the west wall, to the left of a doorway into Viola's bedroom are a couple of barrels and a long end table with a lute on top. While to the right, against the north wall is a set of shelves holding three common books and a bottle of each, alto wine, wine and Nord mead. To the right of this is a chair and further along an empty open crate and then an end table which has a leather strip and a fancy jug and candlestick on top, with a drum on the floor beside it. Further to the right, next to another alcove is a set of shelves holding seven more common books. The L-shaped bedroom through the doorway at the western end of the floor contains a double bed coming out from the west wall with a long unlocked chest at the foot of the bed. To the left in the southwestern corner is an end table with a wash basin on a stand around the corner, with a small coin purse on the floor beside it. To the right of another alcove to the south is a set of shelves holding a potion of regeneration. In the alcove are two corner shelves with a bottle of wine on one and a solution of extra magicka on the other. In the middle of this space is a large round wooden table with a bottle of alto wine, a jug and goblet and bread and cheese on top. Beside the doorway is a bookcase holding nine common books, while on the other side of it is an open crate containing two pairs of boots. There is another long unlocked chest in yet another alcove to the north with a tall wardrobe to the left of the alcove with a small wardrobe on the west wall to the left of the larger one. There is a Loot shadowmark to the bottom right of the entrance door and another one to the right before the arch in front of her house. Vignar Gray-Mane and his court (i.e. Brill and Olfina Gray-Mane) were supposed to go here if exiled, but it is impossible for this to happen, so they will never be seen here. The house and its front door are owned by the WindhelmViolaFaction which Viola is not a member of. This page was last modified on 3 May 2018, at 23:02.